Santa Marta sits on the Caribbean coast line and serves as a gateway to Colombia’s nicer beaches, mountains (the Sierra Nevada) and national parks. It is a very hectic, urban city and has a rep for being quite run down in places but you’ll still find tourists here as they head to explore the surrounding areas. I wouldn’t necessarily recommend coming to Santa Marta unless you also plan to travel along the coast. However, if you are, then spending a night or two here is fine and, if you’re in to a lively nightlife scene, Santa Marta might just fit the bill. Santa Marta has its own (very small) airport so is well connected with domestic flights to Bogota. We drove to Santa Marta from Cartagena using a shuttle service company called Marsol. This was very comfortable and convenient as we were picked up at our hotel in Cartagena and driven to our hotel in Santa Marta – the journey lasts around 4 hours and you share an air conditioned minivan with a few other people, usually tourists. The other option is to take the public bus but this didn’t sound all that appealing for such a long journey. Tickets for Marsol cost around £15 per person and you can ask your hotel to book this for you (or you can buy tickets at the Marsol depot). Santa Marta is an interesting place to walk around. 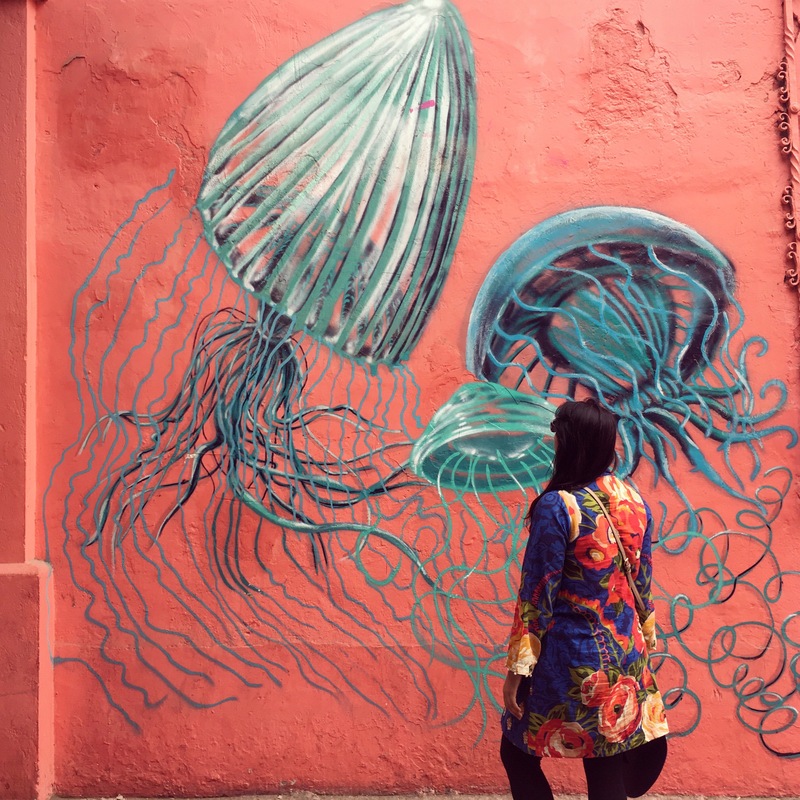 It is definitely a lot less maintained than Cartagena and feels like a regular, developing city but here are some things that you can do whilst in the area! Minca is a small village in the hills surrounding Santa Marta. It is a few degrees cooler than Santa Marta and a lot calmer so a good escape if you’re weary of busy cities. We booked an organised tour through a company called Expotur. They have an office in the old town centre so you can just pop in and book a place. It cost 110,000 pesos per person which is equivalent to around £30 and includes a pickup to and from your hotel, lunch, a guided tour to a coffee plantation and a guided 2 hour hike to a waterfall with some cool views on the way. Expotur also offer other tours and seem most popular for their Ciudad Perdida 4 day trek (Colombia’s equivalent to the Inca trail!). Tayrona National Park is on all travel lists about places to see in Colombia. A day trip is definitely doable from Santa Marta (the park is an hour’s drive away) but you could also spend a night or two in the park itself or nearby. We did this and I talk about the pros and cons in my next post!). Palomino is a small town on the coast and seems to be a very up and coming place. We didn’t get a chance to go here but would’ve if we had more time as the beaches looked really nice. Here’s a very handy guide from StoryV that might be helpful! Although we didn’t go here, it sounded interesting and is a hacienda built in the 17th century, famous for being the death place of Simón Bolívar, Colombia’s National hero. Santa Marta has some cool cafes and restaurants which all centre around Novios park/square. My favourite has to be Cafe Lulo which had amazing juices and gourmet arepas. For snacks or a refreshing smoothie, you can also go to Carambolo. For dinner, check out El Bistro which serves modern European style food. Ouzo, a Greek inspired restaurant is also popular. For burgers, head to Radio Burger. The historic old town is pretty compact and you won’t need taxis much but, if you do, they are pretty cheap. You can take the public bus to Tayrona and Palomino – the tickets are inexpensive (around £2) and the journey isn’t too long for it to be too uncomfortable. Buses are usually found in Santa Marta’s central market (Mercado centraal) and I would recommend taking a taxi to get there. Hope this post was helpful – let me know if you have any cool tips about Santa Marta or the surrounding areas! Did You love Cumbia music?